Although not published until after Matthew Arnold’s death, Max Beerhohm’s caricature is worthy of inclusion, if for no other reason than Beerbohm’s celebrity status. The Poets’ Corner is Beerbohm’s collection of caricatures of 25 of the most influential poets up through the early 1900s. Other poets caricatured include Dante Gabriel Rossetti, Alfred, Lord Tennyson, Walt Whitman, and William Shakespeare. The fact that Beerbohm includes Arnold in this collection is a testament to Arnold’s continued influence, even close to 2 decades after his death. Arnold is pictured with his niece, Mary Augusta Ward (a worthy late Victorian voice in her own right), who is asking him, “Why, Uncle Matthew, oh why, will not you be always wholly serious?” Ward’s appearance in the caricature might lead one to believe that she was just as much a target of Beerbohm’s pen as Arnold. Ward would have been in her fifties when Beerbohm published the cartoon, and presenting her as a young girl, dressed in childish clothing, and turned away from the viewer could be interpreted as a slight. If we assume, though, that Arnold is Beerbohm’s target, we can begin extracting some conclusions from the picture. Arnold’s figure at rest is similar to Tissot’s Vanity Fair piece and, as such, the same inferences can be drawn, especially about his apparent nonchalant attitude towards “practical” concerns. His smile more insidiously brings to mind G.K. Chesterton's later vision of Arnold with "a smile of heart-broken forbearance, as of a teacher in an idiot school," thus Chesterton's assessment of Arnold's "enormously insulting" attitude towards the Populace and the Philistines. 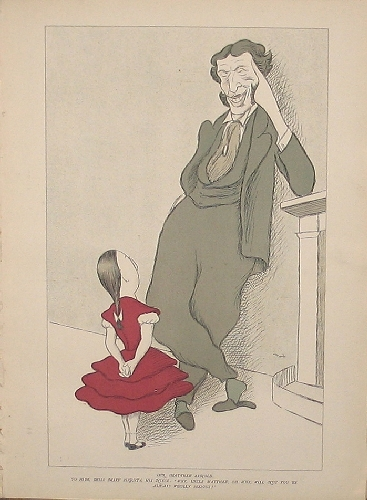 However, there are some significant differences between Tissot and Beerbohm’s caricatures. The clothing Beerbohm chooses to use appears much more in line with a “dandiacal” style of dress. The slacks Arnold wears are loose-fitting, recalling almost a Wildean fashion sense. The loose but large neckerchief, gaudy tie-pin, and slippers add to this dandy presentation. Arnold had become tied to Wilde's aesthetic vision, forming - if not a basis - then at least a point of departure for Wilde's artistic and critical project. Wilde famously inverts Arnold's pronouncement that the function of criticism is "to see the object as in itself it really is" by remarking, in "The Critic as Artist" that the function of the critic is to "see the object as, in itself, it is not" (Arnold, Complete Prose Works III.258).